This vegetable beef soup is made with tender chunks of beef, plenty of vegetables and potatoes, all simmered in a tomato broth. A hearty one pot meal that’s perfect for a cold night! There’s nothing more satisfying than a good soup, my family loves Mexican chicken soup, hamburger soup, and this simple, yet satisfying beef vegetable soup. This soup is a great way to get some veggies into the kids too! In my opinion, the best soups are the heartiest soups! 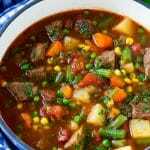 This vegetable beef soup is about as hearty as it gets, with a rainbow of colorful veggies, tender potatoes, and melt-in-your mouth beef. It’s the ultimate soup for a chilly day. 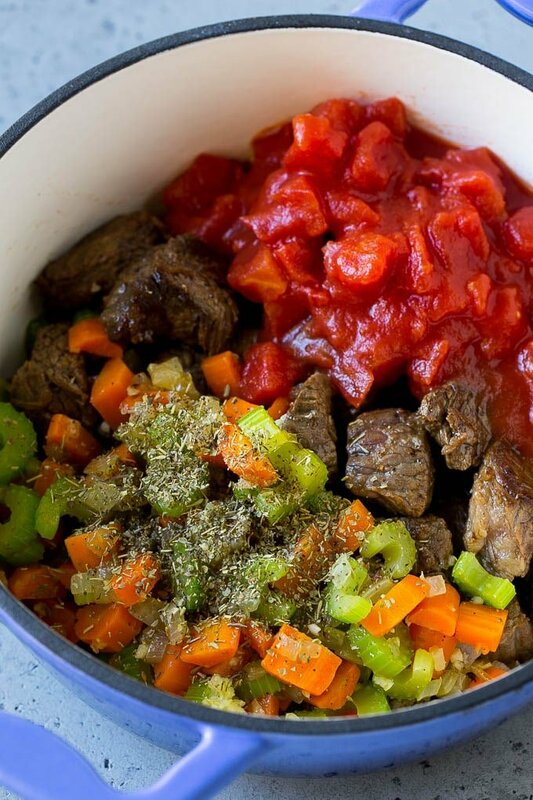 How do you make vegetable beef soup? 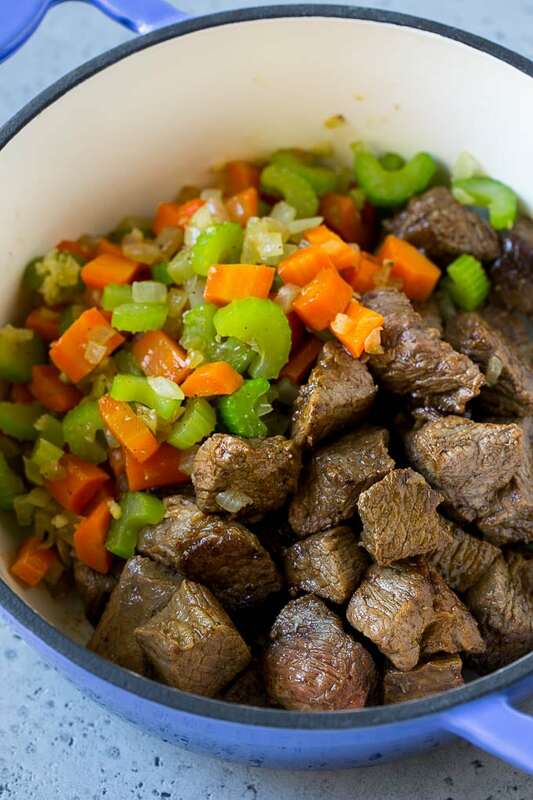 This soup starts with beef stew meat, which is browned along with carrots, onions and celery. The beef and veggies go into a big pot with tomatoes, beef broth and seasonings, then everything simmers away until the beef is tender. A handful of potatoes go into the mix, along with some frozen veggies to make this delectable and easy soup. What is the best cut of meat for vegetable beef soup? I use beef stew meat for this soup because it’s convenient, inexpensive and tastes great. Another option would be to put a pot roast, such as a chuck roast, and cut it into pieces. If you want to make beef vegetable soup and you’re pressed for time, try using 1 1/2 pounds of lean ground beef in lieu of the stew meat. The ground beef will shave a lot of time off the simmering process. What are the best spices to use in vegetable beef soup? I go for convenience here and use dried Italian seasoning in my soup. It’s a blend of dried parsley, basil, oregano and sometimes garlic, and it can be found in almost every grocery store in the spice aisle. This soup needs to simmer for at least an hour for the meat to get tender, so plan accordingly! The carrots, onions and celery simmer with the beef, so they end up quite soft at the end. If you prefer firmer vegetables, you can saute the veggies, then pull them back out of the pan and reserve them to add later on with the potatoes. Choose any potato you like here – I went with the classic Russet potatoes, but red potatoes and Yukon Gold also work great. I use frozen green beans, peas and corn for convenience sake. If you prefer to use fresh feel free, but add a few more minutes to the cook time. 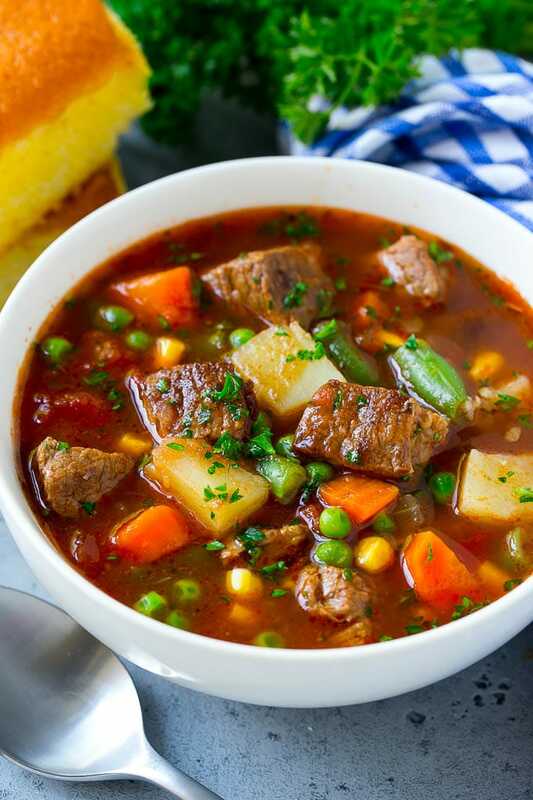 I love to serve vegetable beef soup with a side of bread, such as garlic knots or honey cornbread. This recipe can easily be adapted for the slow cooker. Brown your beef and saute your veggies as directed, then place the beef, vegetables, broth, tomatoes and seasonings in a crock pot. Cook on low for 6-8 hours. Add the potatoes after the 4 hour mark and stir in the frozen green beans, corn and peas right before serving. You just can’t go wrong with this soup – it’s loaded color, flavor and texture and will satisfy even the biggest appetites. This vegetable beef soup is made with tender chunks of beef, plenty of vegetables and potatoes, all simmered in a tomato broth. A hearty one pot meal that's perfect for a cold night! Heat the olive oil in a large pan over medium high heat. 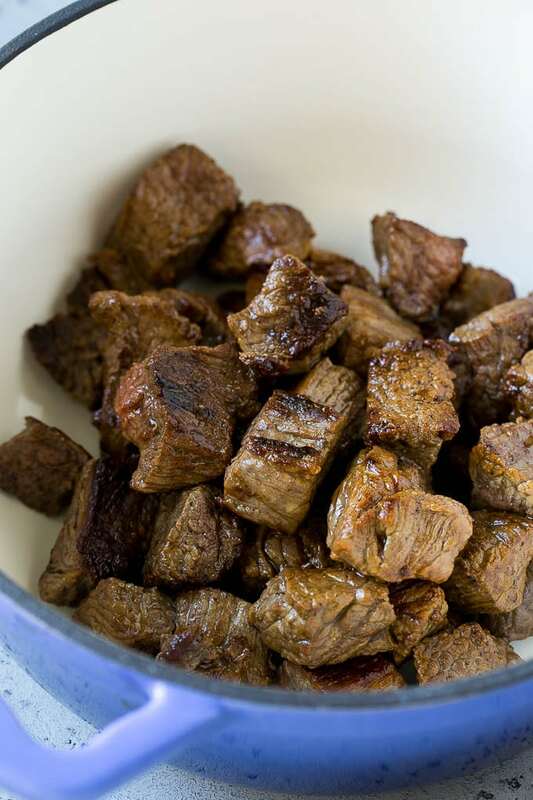 Season the stew meat with salt and pepper to taste. Place half of the meat in the pan in a single layer. Cook for 3-4 minutes per side or until browned. Repeat the process with the remaining beef. Place the meat on a plate and cover to keep warm. Add the onion, carrot and celery to the pan. Cook for 4-5 minutes or until softened. Add the garlic and cook for 30 seconds. Add the beef back to the pot along with the tomatoes, Italian seasoning, bay leaf and beef broth. Bring to a low simmer. Simmer for 60 minutes or until beef is tender. Add the potatoes to the pot and cook for an additional 20 minutes or until tender. Stir in the corn, peas and green beans. Cook for 5 minutes. Season the soup to taste with salt and pepper. Discard bay leaf. Sprinkle with parsley and serve. Still hungry? 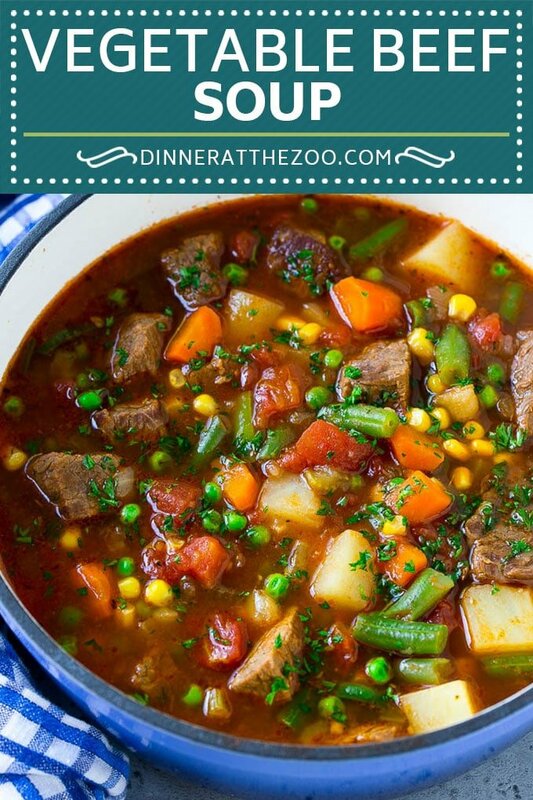 Follow Dinner at the Zoo on Facebook, Twitter, Instagram and Pinterest for more great recipe ideas! What a cosy and comforting soup with goodness, it’s a meal in itself. I can’t get over how delicious this recipe reads and looks! This is the PERFECT way to spend cold winter days, a big bowl of this hearty soup and some bread on the side! It looks like we have a couple days of winter setting in this week so this will make the perfect meal to help warm up!! Pinning for later! This is my second time to make this soup in two weeks! Haha my husband and I couldn’t stop eating it and he asked for it again this weekend. Currently on the stove and smelling Devine! Only thing I changed was I used low sodium beef broth. Never made it with regular (I am sure it is great) I’m just a little sensitive to salt. Seriously, such a good recipe. We will have this in our back pocket for years to come! Thank you!! So happy to hear you enjoyed it, I appreciate you coming back to comment! This is one of my favorite soups! We eat a lot of soup. I tend to make a big pot and hope it would last a few days but it never does LOL. Can’t wait to add this one to the mix. It looks so rich and flavorful! I love a classic beef stew like this, especially with all the cold weather we’ve been having lately. I always feel like stews like this are even better the next day which makes them perfect for meal prep! This looks so hearty and warming! Perfect comfort food for all this cold weather we are having! I agree nothing is as satisfying as a good soup! 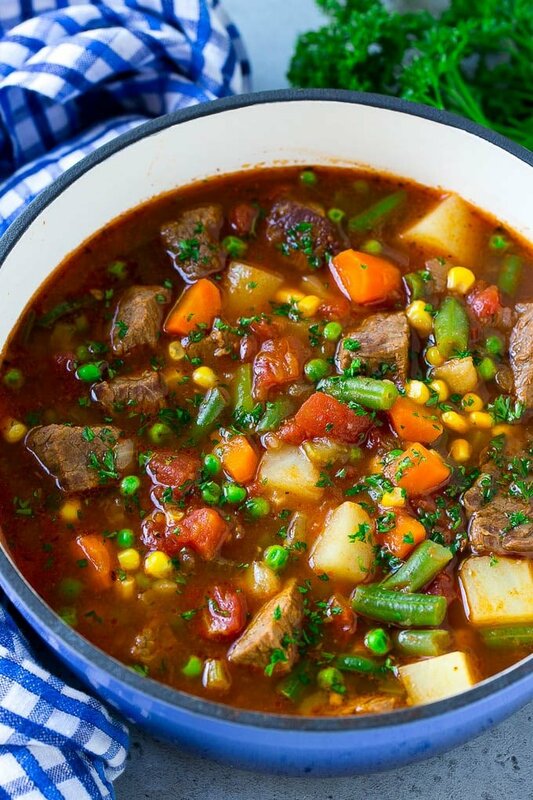 This beef soup looks incredibly hearty and delicious! This just went on my need to make list! I love soups and this one sounds so tasty and healthy! It’s great how packed full of veggies it is and would definitely be a soup my husband and I would love.